Step 2) Rake the lawn: In early spring, once the grass has warmed and the lawn is “workable”, you will want to rake the lawn. Pay particular attention to brown or “dead” areas. Rake these brown spots with a little more force and see what is removed. Some areas will pull up easily, so you will want to remove these patches. Other areas may look totally lifeless because their roots were eaten by grubs last fall. These areas will roll up easily if an edge is shoveled and you pull back on them. Other brown areas will look damaged, but with the spring rain and some fertilizer can grow back, so if you are unsure, give them a chance and you just might be surprised what all comes back! For those areas that need to be reseeded, we have outlined the procedure in the next step. Once you have finished raking and surveying the lawn, you will gain a knowledge of what you are working with and how much seeding you have to do. Step 3) Prepare areas to be seeded: One of the most important steps for seeding is to make sure that there is good soil to seed contact. This means removing the dead grass and thatch that may be preventing the grass seed from laying directly on the soil. Also, you will want to “level off” the ground. Areas may have become lumpy or uneven over time. 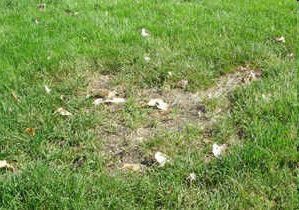 As a result, you will want to level off these bare spots with some top soil so that you don’t end up with divots in the lawn. For complete instructions on how to seed your lawn, please visit our previous article on Planting Grass Seed. Step 4) Fertilize the lawn: In spring our lawns are looking to grow quickly and the idea is to have them fill in and become well established before the hot summer months. Most lawn programs will recommend that you use a crabgrass preventer with fertilizer in early spring. This is a great product to use as long as you are NOT seeding. The crabgrass preventer that is in these products is actually a broad-based weed preventer, so it prevents seeds of all types from germinating, including grass seed, some broadleaf leaves, and many grasses weeds (like crabgrass). If you need to seed this spring, we recommend that you take care of those areas and fertilizer your lawn with a starter fertilizer at the same time as seeding. This will help the grass fill in quickly, but will also strengthen the rest of the lawn. Once your seeds have germinated and been mowed several times, you can then apply a crabgrass control later in the spring. If this timing puts you into May, we recommend that you use Jonathan Green’s crabgrass preventer, since it is both a pre- and post-emergent control for crabgrass! There are also a bunch of organic fertilizers that are great for your lawn and safer for kids and pets, so be sure to ask about these options if you are interested in an all-natural solution. If you follow these steps, you will get your lawn started on the right track this spring. Be sure to check back for more articles throughout the year on lawn care. Of course, if you ever have any questions, please feel free to give us a call or stop by to consult with one of our lawn care specialists in our Lawn and Garden Department!